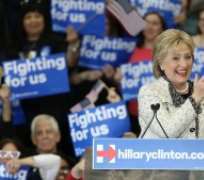 Hilary Clinton trounced her rival Bernie Sanders in South Carolina on Saturday, her second decisive win in a week as she heads into Super Tuesday. “Tomorrow, this campaign goes national,” Clinton said to a fired-up crowd at the volleyball court in the University of South Carolina. She quoted Scripture and asked for more “love and kindness,” in an effort to distinguish herself from Trump. The win dims Sanders' prospects but at the same time makes it even more urgent for Clinton to appeal to his supporters, a passionate part of the Democratic base she can ill-afford to alienate before the general election.